I never would have picked this up if it hadn’t been for the The Book Smugglers’ rave review. That ornamenty, flowery cover, the blurb telling of two best friends who seem to fall in love with the same guy or something… none if it sounded up my alley. Then I read that it’s an Orpheus and Eurydice retelling with a twist. And I was sold. First sentence: Aurora and I live in a world without fathers. Suddenly, each girl must decide what matters most: friendship, or love. What both girls don’t know is that the stakes are even higher than either of them could have imagined. They’re not the only ones who have noticed Jack’s gift; his music has awakened an ancient evil—and a world both above and below which may not be mythical at all. We have paved over the ancient world but that does not mean we have erased it. 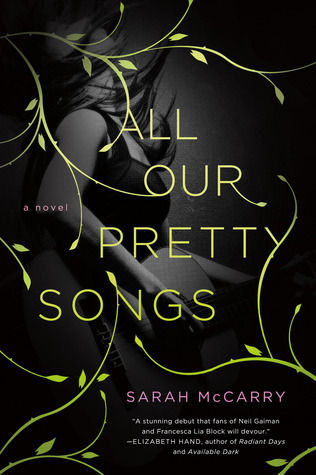 The real and the mystical; the romantic and the heartbreaking all begin to swirl together in All Our Pretty Songs, Sarah McCarry’s brilliant debut, carrying the two on journey that is both enthralling and terrifying. The nameless narrator and Aurora are like sisters. Their mothers were best friends before something happened that drove a wedge between them forever. And their daughters have been inseparable since birth despite being so very different. 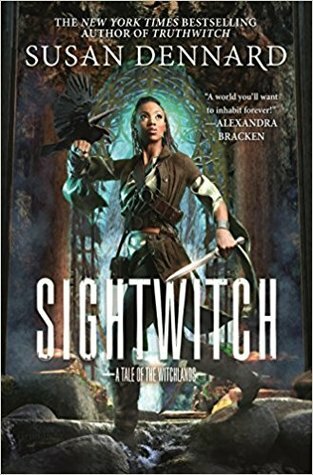 Where Aurora is dark-skinned and beautiful, with hair bleached white and a body to kill for, the narrator is more ordinary, doesn’t like wearing dresses (or colors for that matter) and considers herself to be plain, with a mean face. Aurora is impulsive and reckless, the narrator considers the consequences of things and takes care of her best friend when she’s gone too far again with alcohol, drugs, or men. It’s quite impressive how the author sets the scene for what is essentially a very straight-forward and simple plot. The first pages of the book are so dense that I couldn’t put it down. There is very, very little dialogue throughout the novel but our narrator’s voice is so engaging that I was never bored. Instead, whilte the story is firmly rooted in the real world, dealing with teenagers who grew up in musicians’ households, there is a poetic touch to the author’s voice. Discovering who our narrator and Aurora are, what kind of childhood they had, and what makes them such tight friends, was thrilling enough. No need for snappy dialogue or comic relief. Immersive. That’s the word I’m looking for. I am sure if you’re one of the people who say the magic in Pan’s Labyrinth isn’t real, you can read this as a contemporary YA novel, with drugs being responsible for anything supernatural that the narrator thinks is happening. But I’ve always been one to say Yes to the magic and take it seriously. Never mind if the author intended it as a metaphor for real world developments, to me, the magic will always be real! Mythology is subtly but constanly woven into the narrative and, yes, I take it all at face value. ‘Boudeuse et dépitée’ is what Bertrand says of the mermaid: peevish and sulky, not heartbroken. None of the creatures from that world understand the way human emotions work. They’re all mimicking what they see in us. They can’t create things. They can only steal from us. They’re forever crossing over to wreak havoc because they’re jealous. Anyone familiar with the legend of Orpheus will know that he went down to the Underworld to get back his beloved Eurydice. Now there is a painfully talented musician in All Our Pretty Songs as well, and music plays a big part in thei girls’ lives. When Jack arrives at one of Aurora’s parties, the narrator falls head over heels in love with him. And he falls in love with her. This is where the book became interesting, psychologically. Because although we know that Jack is really in love with the grumpy, introvert narrator, she herself can’t quite believe that someone would choose her over her best friend. Aurora can’t keep the guys away from her. Her beauty and easy nature, her never thinking about tomorrow, seems to draw them in. But for the first time, the narrator is jealous of her and resents her a little bit for how easy she has it. That is the story of you, Aurora: You are always waiting until tomorrow to be sad. You’re a fairy princess beaming at me, remaking the world in your image. Wiping away everything that hurts. But someday everything that hurts will come back and kill you. I absolutely loved how, through descriptions of her best friend, the narrator really told us more about herself. In the end, it becomes blatantly clear that all these things she’s told us about her best friend, their childhood games, their rituals, the music they love and how they grew up without fathers and two very un-motherly mothers, still don’t really tell us who Aurora is and what drives her. There are many things to say about the ending. It does involve the Underworld, and it is about someone trying to save someone else from death. But there are twists along the way that I didn’t see coming. I liked the tone of it very much. I loved how some things work out and others don’t. This is a book about growing up (or refusing to) and how different the experience is for different people. Whether you’re a girl who has to let her first love go, or another girl whose beauty has kept people from getting really close to her, or a mother who can’t let go of the past, age usually doesn’t have anything to do with growing up. The only truly adult person in the entire book was Raoul, the narrator’s gay friend. He’s there when she needs him, he keeps her down to earth, and his advice juxtaposed with Aurora’s carelessness makes the difference all the clearer. A companion book will be published this year, telling the story of the girls’ mothers and, I assume, how their friendship shattered. The blurb says this will be a retelling of the Persephone myth, and I’ve always had a thing for Persephone. So count me in. This looks really, really goo and I am glad you put it on my radar. I love loose twists of classic myths (though in execution it often fails). And I am with you, magic is magic; even if you can sometimes see behind the curtain. The Orpheus myth comes into play very late in the novel and despite my eagerness to finally get to that part, the novel was great from the beginning. I don’t normally enjoy contemporary books or romances, so I’m as surprised as anyone how much I liked this. I’ve been meaning to read this book for months before it even released, and yet somehow it kept slipping through the cracks. No more, though! I do want to read it this year. The whole it being a retelling of Orphues & Eurydice is what intrigues me as well, and I’m very intrigued to see how the characters fall into their retelling roles and who plays whom, so to speak. And, wow, if your quotes are anything to go by, this sounds like it’s beautifully written. Wonderful review!